Beginning in 1979 San Ramon’s Incorporation Study Committee chaired by Joe Covello drew volunteers from throughout the community, especially homeowner, service and sport groups. San Ramon leaders met with County Supervisor Robert Schroder and convinced him that their community deserved the chance to vote on incorporation. The Study Committee had much to work through before the cityhood issue got to the ballot. One major hurdle was the Local Agency Formation Commission (LAFCO) and its executive officer Dewey Mansfield. LAFCO had been set up to prevent unviable special districts and cities from forming and Mansfield had vigorously opposed Danville’s incorporation vote in 1982. He wanted the whole valley to vote on incorporation, even though three valley-wide votes (1967, 1973 and 1976) had failed. When Danville advocates lobbied the Commissioners and convinced them to support a Danville-only vote, Mansfield said that other communities in the valley could then annex to Danville. But the San Ramon activists fought to have their own vote and their own city. Mansfield recommended against a separate San Ramon election and was overruled by his Commission at their meeting in July, 1982. The reporter also noted some signs of sharp politicking around the LAFCO meeting which focused on San Ramon’s boundary. The W. R. Grace Development, which is today’s Crow Canyon Commons, tried to be omitted but was kept inside the proposed city. The 585-acre Bishop Ranch Business Park was excluded. Owners Alex and Masud Mehran were in the midst of it planning the Business Park and county officials, including Supervisor Schroder (who was also Chairman of LAFCO), said they did not want a new government potentially altering plans for the development. At the time 15,000 local jobs were expected to locate at the Park. The boundary was a huge issue during the election and was brought up in every debate. But a vigorous campaign touted independence for San Ramon, better public works, improved parks and public safety, and more responsive local government. “Let’s Spend San Ramon Money on Improving San Ramon!” announced one brochure. Eighteen candidates tossed hats into the ring, with two opposed to the whole idea and one who wanted to annex to Danville. On election day, March 8, 1983, voters overwhelmingly supported incorporation, 3825 to 1254. They elected Diane Schinnerer (3249), Rick Harmon (2504), Mary Lou Oliver (2459), Wayne Bennett (2014) and Jerry Ajlouny (1828) to the first City Council. 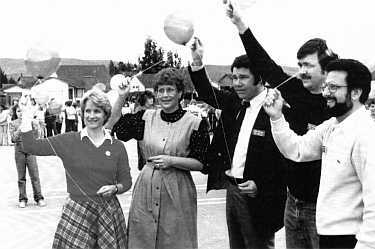 On July 1, 1983, San Ramon became the seventeenth city in Contra Costa County, with a population of 24,000 people. Diane Schinnerer became the first Mayor. Twenty-five years later, Bishop Ranch Business Park is part of San Ramon and the thriving city has grown to 59,000 people. Sources: Museum of the San Ramon Valley archives, The Valley Times (July 15, 1982), The Valley Pioneer (Jan 26, Feb. 2, March 9, June 29, July 6, 1983).